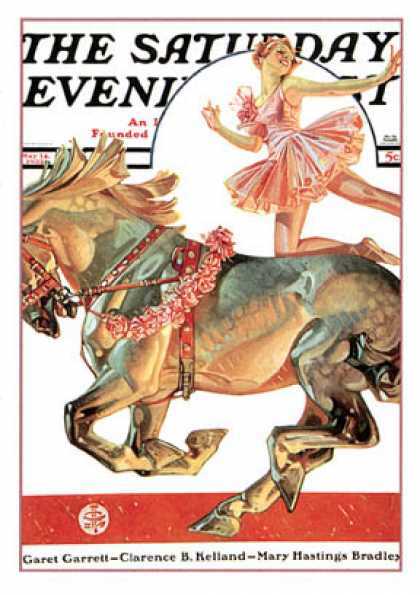 If you don't know J.C. Leyendecker, you ought to! He is an exceptional painter characterized by a style of luscious color and dynamic expressions. Bold lines and gestures fill his paintings down to every last brush stroke! When most people think of the Saturday Evening Post they think of Norman Rockwell. In-fact, after discovering the Post and Rockwell at a young age, I can honestly say I didn't even know J.C. Lyendecker existed until much, much later. Now, with little reservations, I can honestly say that I believe when people think of the Post, they should think of J.C. Leyendecker! I immediately ran out and bought copy of a Biography filled with images and information about Leyendecker and drool over every page in it. Now if you own this book, bravo good sirs and madams! Hat's off to you! And if you don't own it, get a copy! Artist or not, I can guarantee you won't be disappointed! 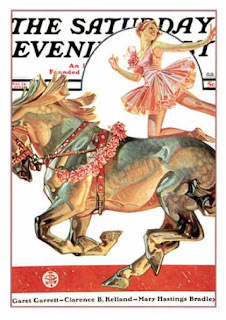 Anyways, above is the original painting cover done by Leyendecker for the Saturday Evening Post. Below is my photoshop in progress study! 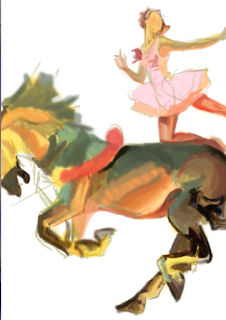 I actually like how abstract it is looking right now, especially with all the lines of the under-drawing showing through. :) Hope you like it! !